It’s officially here ladies and gentlemen, March Madness is upon us. 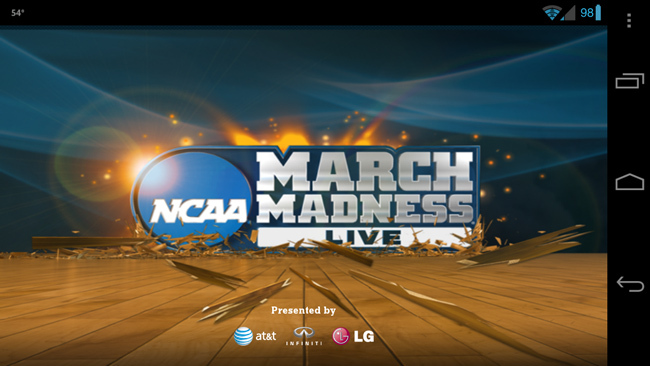 During the selection show last night, CBS and the NCAA announced their app for Android was live in the Play Store now and told us all to go download it. It is a surprisingly well designed and well running application that is free to download and use, but you can also pay to upgrade. For $3.99 you get access to every single game in tournament on your mobile device and online. You don’t have to upgrade but for some people this will be a must for the tournament. Inside the app you can see your bracket, an overall bracket and even go in and live chat with other people about certain match ups between teams. The app is listed as working on every Android but there are a few catches; streaming only works on Froyo, 2.2, or Gingerbread, 2.3, at the moment. No tablet support either, which is a bummer. There have been reports in the reviews of it not working on certain devices but as you can see, the Galaxy Nexus is working great (no streaming though). If you are feeling like filling out your bracket, hit the link for the Play Store below.